YAO Jui-chung, Yao's Journey to Australia. 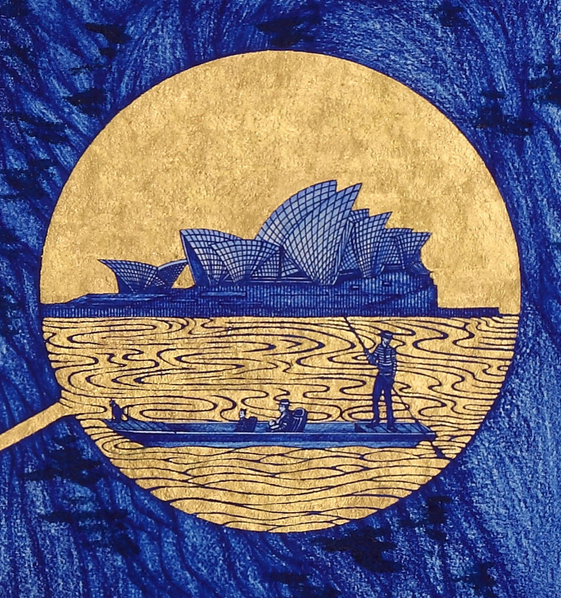 2015, biro, blue ink with gold leaf on India handmade paper, 195 x 539 cm. Mention Chinese art and most people think of brush-and-ink painting, a medium that has been around for at least 2,000 years. The image that springs to mind is of a craggy mountain with a sprinkling of equally contorted trees. The scene may be wreathed in mist, with a tiny sage perched on a ledge. In China such works are referred to as guohua – which means “national painting”. It’s a term that became problematic in Taiwan at the end of the Second World War when the Kuomintang took control of the island from the Japanese. The guohua painters who had arrived from the mainland saw themselves as exponents of a true ‘national’ art, while the Taiwanese who had trained with the Japanese were left battling for credibility in a land where they had previously been the Establishment. 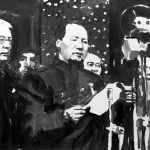 With the subsequent controversy as to whether Taiwan or the mainland was the legitimate “China”, the battles among art movements would persist for decades. According to An-yi Pan in the catalogue of the exhibition, Ink Remix: Contemporary art from mainland China, Taiwan and Hong Kong, at the UNSW Galleries, “the dust did not settle until 1983” when separate categories were established in the annual national exhibition. 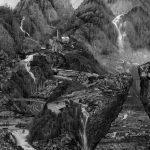 In the 1980s-90s another battle was fought within the broader sphere of Chinese art as to whether brush-and-ink had a contemporary role, or was merely a throwback to another era. The strong sense of tradition in this form of painting was a liability in those years when Chinese artists sought to be part of the wider world. Today, a revitalised brush-and-ink is back in force, with exhibitions being held all over America, Europe and Asia. One reason for this revival is that the Chinese art scene has gone beyond the point where it craves acceptance by the west, and has become critical of the superficial, commodified art acquired so avidly by museums and wealthy private collectors. A new generation is drawing upon the age-old traditions of Chinese art, bound up with Buddhist and Taoist philosophies that feel attractive at a time when China has embraced a gross materialism. Ink Remix has been skilfully put together by freelance curator, Sophie McIntyre, to reflect the many ways that artists from China, Taiwan and Hong Kong are forging new paths with brush-and-ink. Of 35 works by 14 artists the majority of pieces have not been made with a brush. When brushes have been used, it is never in a traditional manner. Most artists have utilised new technology as a way of creating and presenting work. 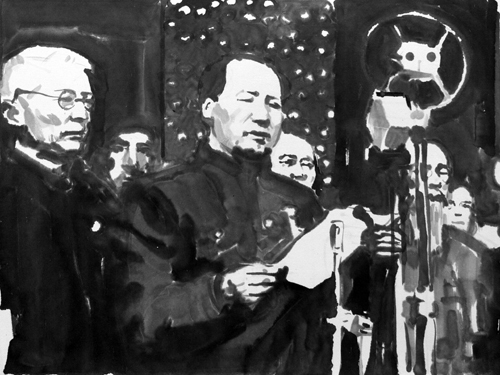 FENG Mengbo, JTTW2010V07 (from Journey to the West series), 2010, Chinese ink, tea and ink jet on xuan paper, 154.5 x 79.5 x 4.6 cm. 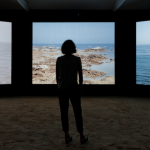 Chen Shaoxiong, Feng Mengbo, Hung Keung, Cindy Ng, Peng Hung-Chih, Charwei Tsai and Yang Yongliang have found completely different ways of employing video. 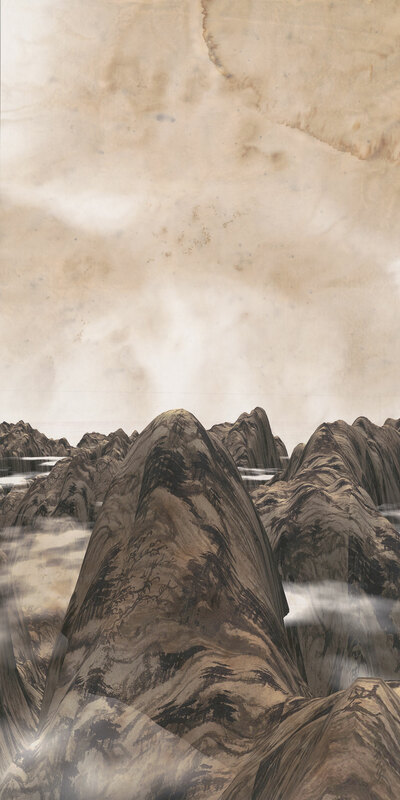 Feng, who is one of the pioneers of video art in China, has become increasingly obsessed with traditional Chinese landscape, to the point where his series, Journey to the west (2010), features large-scale mountains that have been created on a computer and printed with an ink-jet, although this is far from obvious to the casual viewer. Charwei Tsai has used time-lapse photography to show a slab of tofu inscribed with the characters for the Heart Sutra, gradually decaying. It’s a lesson in the Buddhist belief in the ephemerality of material things. 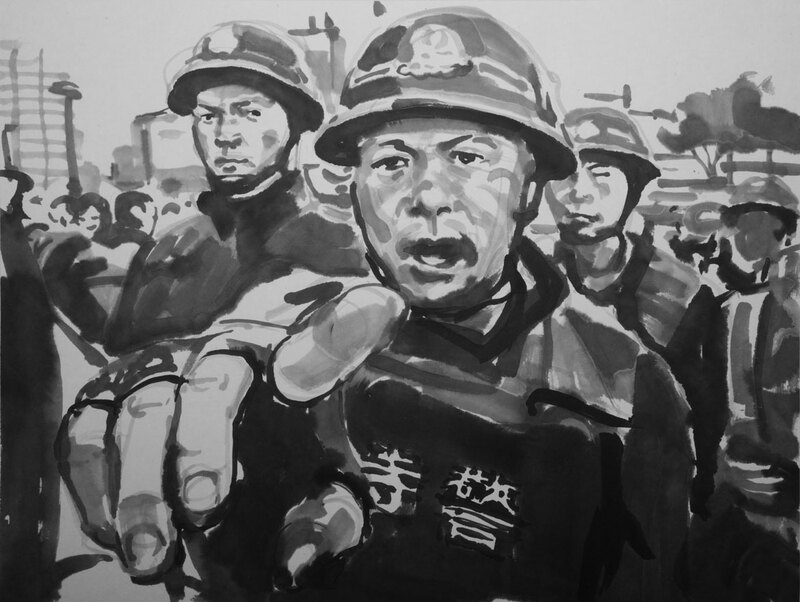 Chen Shaoxiong’s Ink History (2010) and Ink Media (2013) present rapidly changing montages of images drawn from 20th century Chinese history, and from photos of protests and demonstrations found on the Internet. Every image has been copied by the artist as a virtuoso brush-and-ink sketch, bringing a new vividness to these scenes. We may become numbed by an endless procession of news photographs, but these rapidly-drawn pictures imbue every incident with a sense of urgency. 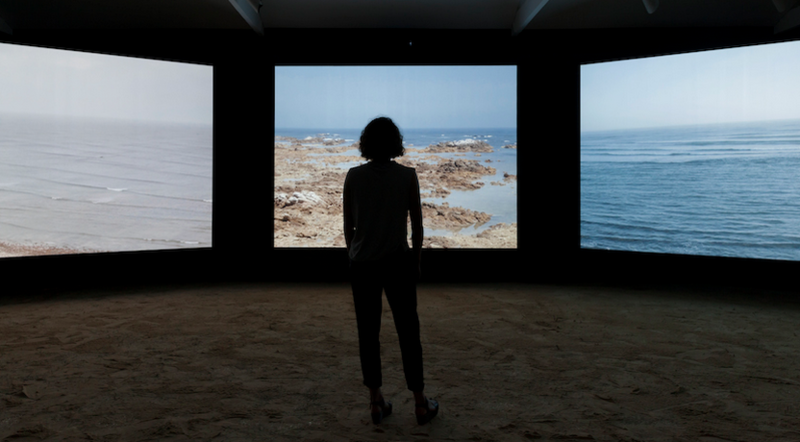 Yang Yongliang’s elaborate video installations and stills have made him one of the emerging stars of Chinese contemporary art. Rising Mist (2014) is a brilliant example of his approach – a video image of a traditional-style Chinese landscape overlaid with apartment blocks, factories, roads and bridges. A slowly rising mist is not a romantic device, but mere pollution. 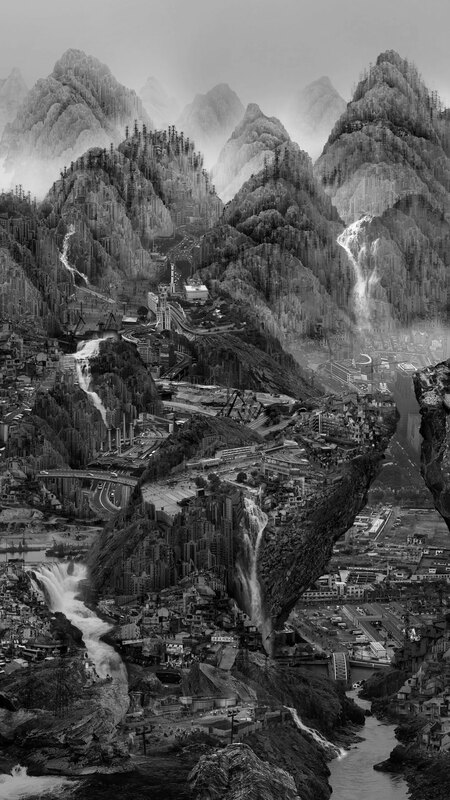 Of those artists who don’t use video, Qiu Zhijie is the most traditional, but his landscapes are flattened out – viewed like maps from an aerial perspective. If one were of a paranoid disposition it could be called a drone’s eye view. By contrast, Yao Jiu-Chung makes large, gaudy pictures in gold leaf and blue biro that feel like Liberace’s idea of Chinese landscape. 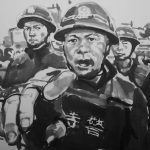 The exhibition also includes examples of gongbi (fine line) work, with the satirical figures of Wilson Shieh, and Peng Wei’s delicate images painted on slippers, knee boots and the torso of a mannequin. Peng is one of those fastidious perfectionists, rather like Cressida Campbell, whose work appeals to both the general public and the experts. This quick overview can’t begin to do justice to yet another show that reminds us the Chinese are way ahead of everyone else in the contemporary art game. Ink Remix demonstrates how much may be achieved by a group of imaginative, innovative artists who have a respect for tradition, but not perhaps for the hermetic attitudes of those literati painters of the Yuan dynasty, who adopted brush-and-ink as a part of their withdrawal from the world and the cultivation of the self. For the artists in this exhibition the ongoing turbulence of life in China is a major source of inspiration. 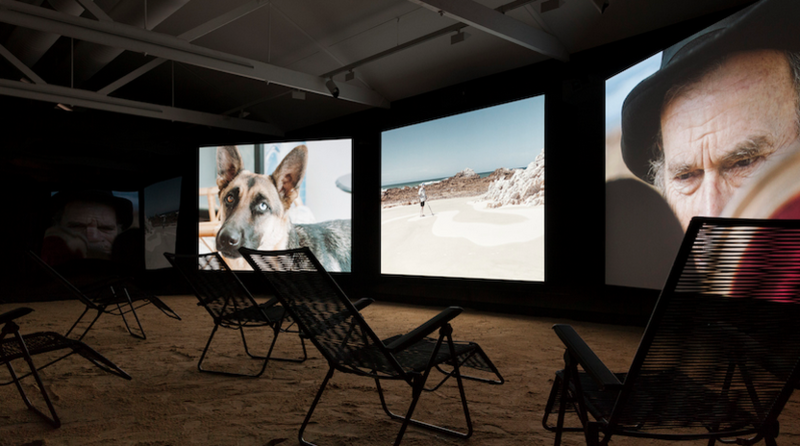 Mikhael Subotzky is a South African photographer who worked with Magnum before branching out into large-scale video installations. Born in 1981, Subotzky is old enough to remember apartheid, which came to an end with the election of 1994, but is more concerned with the adjustments South Africans have had to make living under a new system while trying to deal with the legacies of the past. Many chose not to adjust but to migrate to places such as Australia. By 1994, Gene and Brian Sherman, who are hosting Subotzky’s WYE at the Sherman Contemporary Art Foundation, had been living in Australia for 18 years. They can, however, recognise the feelings that Subotzy explores. 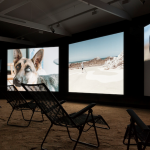 Feio, an invisible narrator in some future age, is channeling the thoughts and memories of a man called Hare, whom we meet on screen two, fossicking on a beach near Cape Recife. Hare’s metal detector locates a box, left by Lethbridge, a British traveller of the 1860s. On screen three we see Lethbridge fussing with his divining rod, and writing a letter that both Hare and Feio will eventually read. 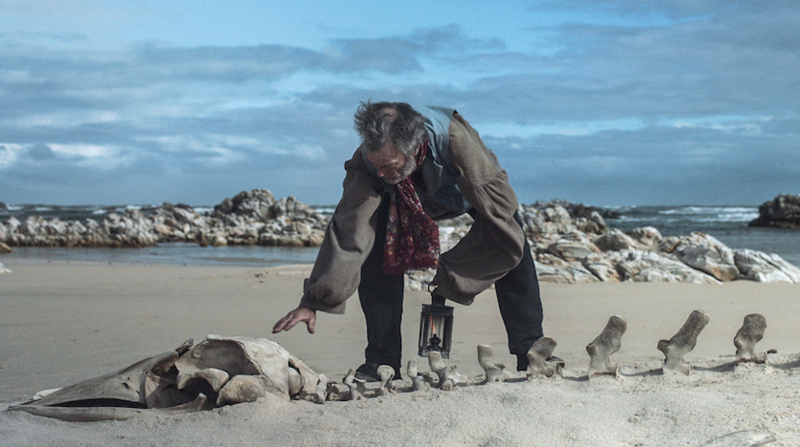 The major part of a narrative repeated three times over the course of 45 minutes, is when Hare meets Hermanus, a homeless coloured man, who helps him dig for the box. At first he thinks Hermanus is a beggar, and feels instinctively threatened by him. When it’s all over, Hare is pained by his own awkwardness. Feio tells us this is the reason Hare felt he could no longer live in South Africa, and would subsequently move to Australia. There are others layers to the story but the encounter on the beach is crucial. 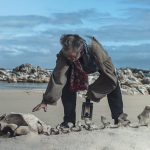 It identifies the work as a meditation on the fractured nature of South African identity, through a 19th century character who goes troppo at the bottom of the world, and man of the present who doesn’t feel he belongs any more in the land of his birth. The larger subject is colonialism. Lethbridge implicitly believes in the colonial project and goes mad. Hare feels oppressed by its lingering overtones, and Feio looks on as a dispassionate observer from a world we assume is built on more rational lines. WYE is beautifully shot, as one might expect from a Magnum photographer collaborating with cinematographer, Jörg Schimdt-Retwein, known for his work with Werner Herzog. The problem is that the repetitive format, which works so well in films like Rashomon, never supplies the growing fascination such a device can and should generate. Instead of being mesmerised, I was mildly bored – a sure sign that WYE is not a piece of cinema, but a work of art.